Only you can decide when it’s time to retire, but you should know that your age at retirement can affect your pension benefit. Some New York State and Local Retirement System (NYSLRS) members are in special plans that allow for retirement after a certain number of years, regardless of age (for example, police officers, firefighters, correction officers or sheriffs). But for most members, you can retire with full benefits at the age specified by your plan. Most members can choose to retire as early as age 55, but if you do, you may receive a permanently reduced pension benefit. Most retirement plans have an age requirement to retire with full benefits. For Employees’ Retirement System (ERS) members in Tiers 2, 3, 4 and 5 and Police and Fire Retirement System (PFRS) members in Tiers 2, 3, 5 and 6, the full retirement age is 62. For ERS Tier 6 members, it’s 63. PFRS Tier 6 members who have left their PFRS employer are eligible for their benefits at age 63. In some retirement plans, members with a certain amount of service credit can retire at age 55 without being subject to benefit reductions. Benefit reductions don’t apply to ERS Tier 2, 3 or 4 members who have 30 or more years of service credit and Tier 2, 3, 4 and 5 Uniformed Court Officers and Peace Officers employed by the Unified Court System who have 30 or more years of service. Retirement benefits for all other ERS Tier 5 and Tier 6 members, and PFRS Tier 2, 3, 5 and 6 members not in a special 20- or 25-year plan, will be reduced for early retirement — even if they have 30 years of service credit. These benefit reductions are prorated by month, so the closer you are to your full retirement age, the less the reduction will be. 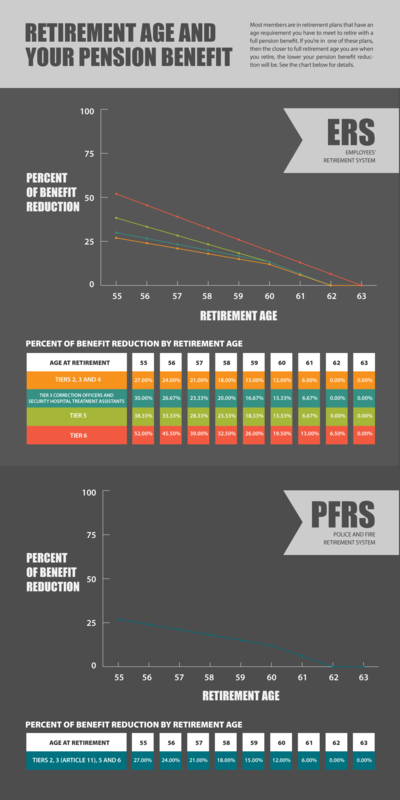 Once you retire with a reduced benefit, that reduction is permanent. Contact us if you have any questions about benefit reductions or any other retirement-related topics. Please review your retirement plan booklet for a full description of the benefits you’re entitled to as well as any reductions and restrictions. Content last revised March 21, 2018. This entry was posted in General News, Members and tagged Age Requirements, benefit reduction, benefits, ERS, full retirement ages, know your benefits, members, New York State & Local Retirement System, NYSLRS, PFRS, Preparing to Retire, retirement age, retirement planning, Service credit, service credit exceptions on March 21, 2018 by NYSLRS.